Before it was a blockbuster sci-fi comedy movie, Men in Black was a short-run black and white comic from Aircel. 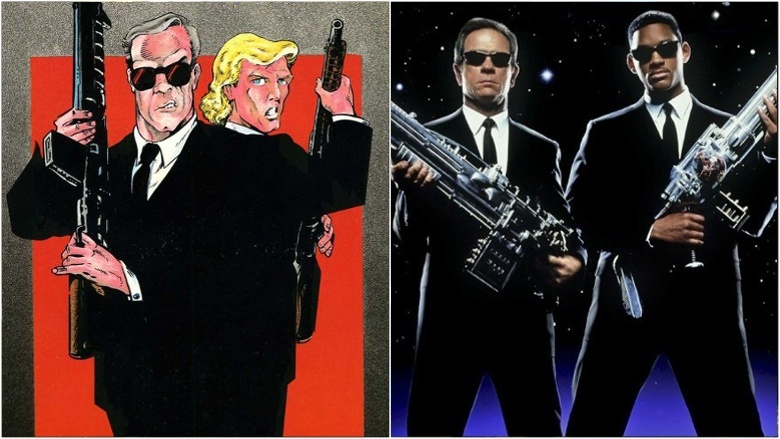 Other than the overarching concept of mysterious well-dressed "Men in Black" acting behind the scenes of extraterrestrial activity on Earth to keep it quiet and contained, the comic doesn't really resemble the movie much. The comic book storyline was very X-Files-ish, even though it pre-dated that series by a few years. Each issue had a Monster Of The Week the MiB were assigned to track down. As such, only a handful of characters made it to the big screen, in many cases wildly different than they originally appeared. This one is definitely the most dramatic character shift, but honestly at this point we really couldn't imagine anyone else but Will Smith as Agent J. The original Agent J was a DEA officer recruited by Agent K in the middle of a drug bust. Because this was the late '80s, he was a blonde white guy with a feathered mullet. 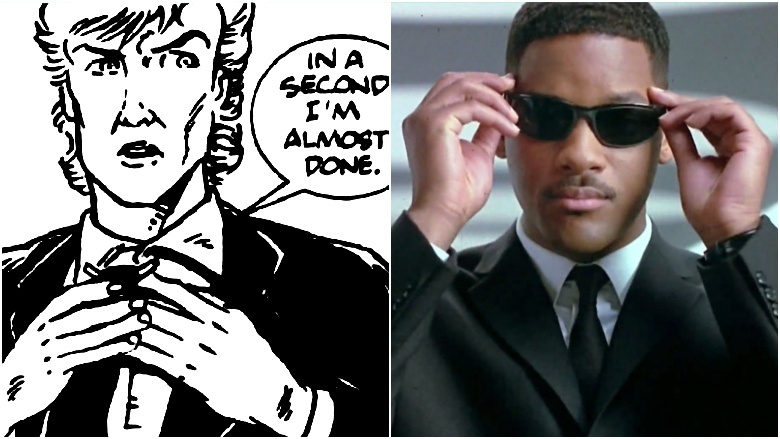 The character as crafted by Will Smith brought a wit and savvy to the character that really didn't exist in the comic book version, who was mostly an unwitting and reluctant foil of the brash and weathered Agent K.
Agent K is the older, more experienced of the core partnership that drives the Men in Black series. He loves big guns and diving into situations that seem to be well over his head, and then winning against the odds anyway, much to the terror and consternation of Agent J. Tommy Lee Jones brought a gruff earthiness to the character, while the original was more chaotic, taunting, and deliberately inscrutable. 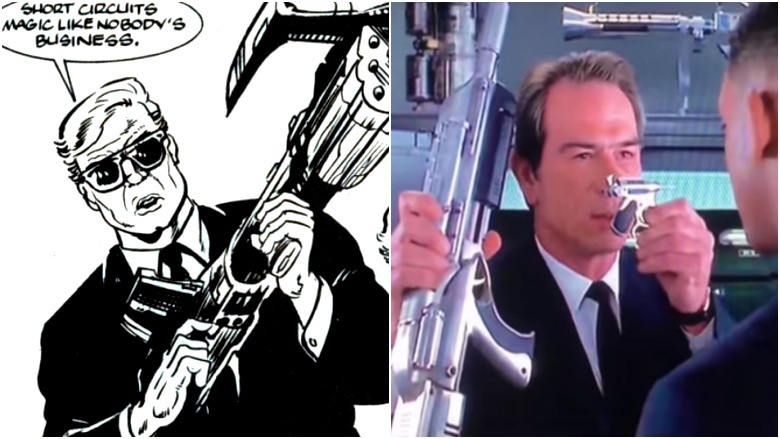 Visually, the original seems a lot more like a giant laser-rifle toting version of X-Files' Smoking Man character than the almost fatherly good-natured Tommy Lee Jones mentor version. The original has a sort of brunette combover in contrast to Tommy Lee Jones' more stylish, close-cut hairstyle and is constantly wearing the protective sunglasses. Edgar (named Horace in the comic) is a down-on-his-luck rural man who lives out in the sticks and encounters a horrible, bug-like alien. 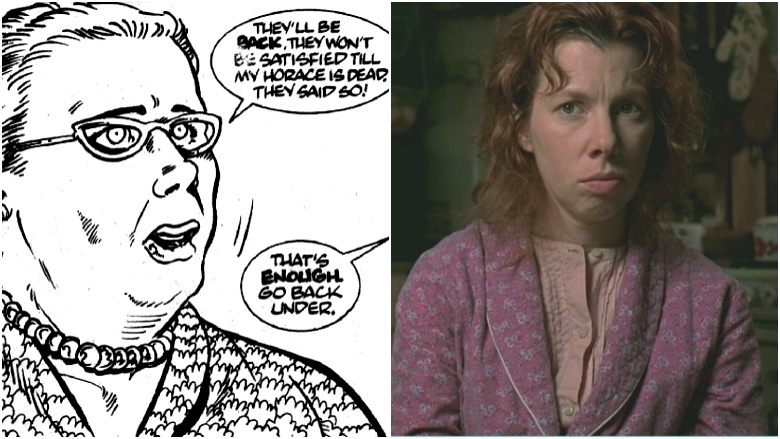 The comic book version is much older and overweight with thinning gray hair. Vincent D'Onofrio's take on the character is mostly defined by his hideous transformation when the bug kills him and wears his skin (which doesn't happen in the comic), and he brings in an angle of domestic violence not present in the initial character, perhaps to lessen compassion toward what wound up being his horrifying fate. The original is more of a one-note "backwoods hick that sees flying saucers" stereotype while the movie version packs a surprising amount of character development into the 90 seconds where he keeps his own brain (and skin). Beatrice (named Myrna in the book) is Edgar's wife. 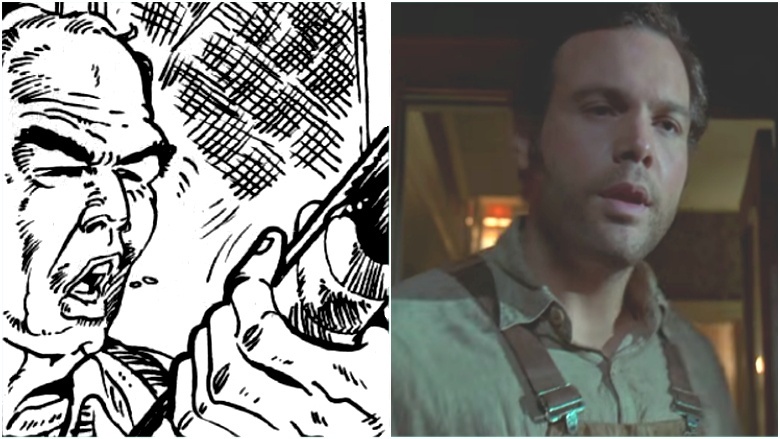 Much like Edgar, the original comic book version was significantly older. The original wears grandma-print dresses and a string of pearls with antique horn-rimmed glasses. Siobhan Fallon's take on the character is much more disheveled, with stringy hair and wearing a bathrobe over a blouse as daywear. Neither get a whole lot of dialog except to confirm the sighting of the UFO. However, the movie version also bears the trauma of an abusive husband replaced by a bug wearing his skin. At least until Agent J scrambles her brain with a neuralyzer. In the comic, the bugs are the antagonists of just one issue. In the movie, one bug winds up driving the plot of the entire film. The comic bugs are a scavenger race assigned to gather items for their hive, one being the rifle owned by Horace (Edgar in the movie). Their initial encounter is similar, with Edgar (Horace) saying they can "pry the rifle out of his cold dead fingers," a suggestion both versions of the bugs agree to. From there, the plot veers wildly. 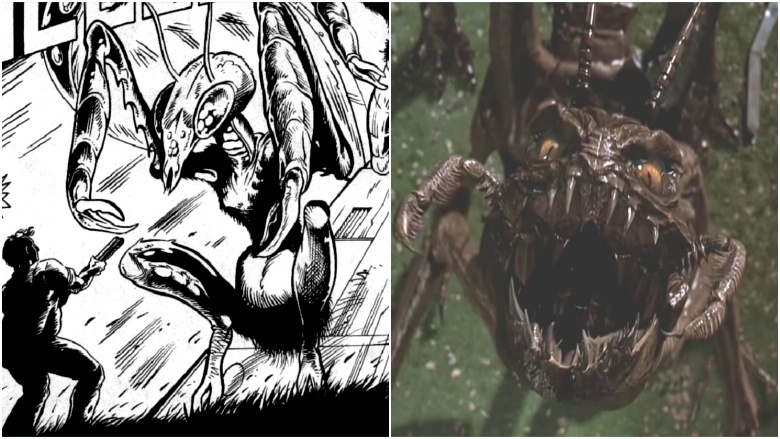 As for appearance, the comic bugs have a distinctly praying mantis appearance, whereas the movie version is modeled more off some sort of hideous mutant cockroach. It has more legs and a longer body than the original, which is a squat quadruped. They also give the bug a hinged jaw and mandibles, while the original just has the latter. It also has a more lizard-like face with front-facing stilted eyes and a snout-like head compared to the original's insectoid cranium.